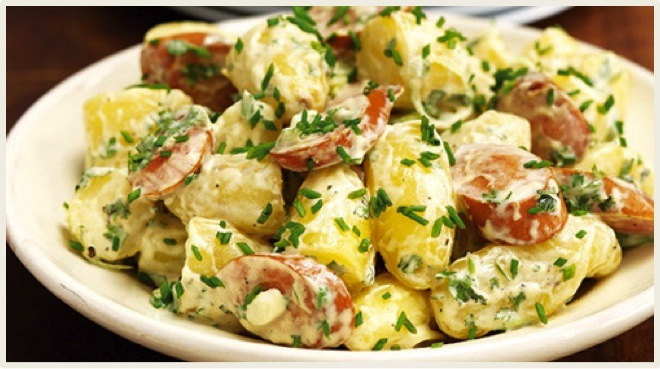 Sausage and Potato Salad (serves 4) – Try this delicious and easy to make salad, ideal for your 4th of July celebration. Bring a large pot of water to a boil. Add the potatoes; boil about 25 minutes or until tender. Drain and let cool. Cut potatoes into quarters and place in a large bowl. Cook string beans in salt water, boil potatoes for about 25 minutes. Drain and let cool. Clean radish and cut into thin slices, peel onion and cut into thin rings, wash parsley and chop finely. In a bowl mix together mustard, vinegar, oil, egg yolk and heavy cream. Add salt, white pepper and sugar to taste. Pour dressing over the salad and mix all ingredients together, cut chive in small rolls, sprinkle over salad. Remember: Salad tastes best if prepared an hour before serving.